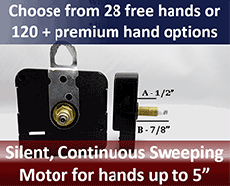 Clock Movement price includes one of 28 free hands under 5" length (or choose from dozens of other styles) and mounting hardware plus a 3 year warranty on the clock mechanisms. 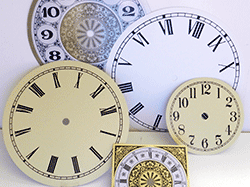 North American Made by TAKANE, the mini quartz clock mechanism is the standard in the industry. 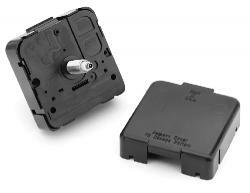 Great for the hobbyist or serious clock-maker, our clock motors are absolutely reliable. They run on one 'AA' battery and are accurate to within two minutes a year. 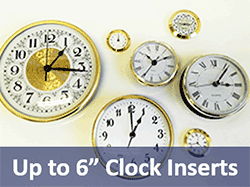 We stock six shaft lengths to accommodate clock dial thicknesses from 1/8" to 3/4' thick. 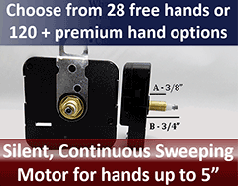 Our USA made standard clock motors will drive hands up to 4-7/8" long which means you can make a clock up to 12" in diameter. 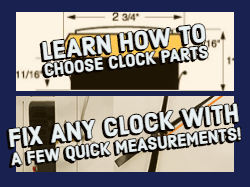 For larger clocks, click here to choose a high torque (more power) clock motor and longer hands. Step 1) Choose a Clock Motor based on the steps in the diagram above or tips just below. 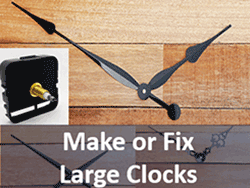 When repairing a clock we always recommend new hands as your old ones may not fit. 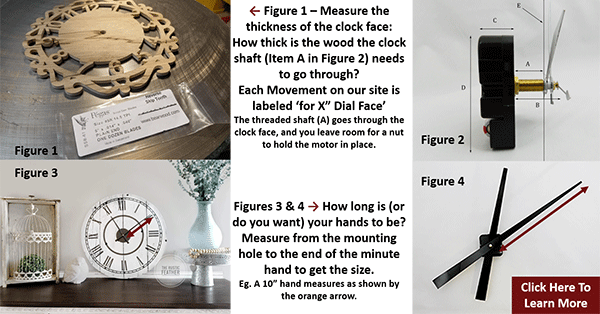 Making a clock larger than 11 inches in diameter? 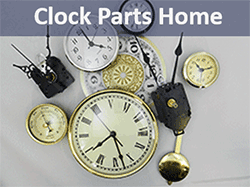 What is the difference between high torque and standard quartz clock movements? 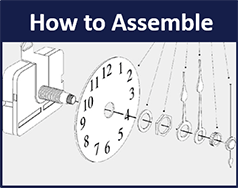 What are the different types of standard/mini clock movements? 1) USA Made Step Style by Takane (AA batteries) These movements will make a very slight stepping sound. 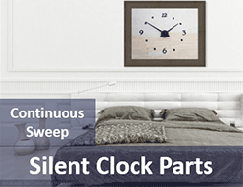 2) Continuous Sweep Clock Movements operate virtually silently with a sweeping second hand motion. 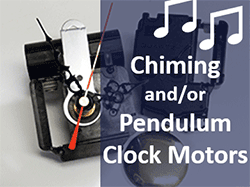 3) » Click Here for Pendulum, Chiming, Pendulum + Chime Movements in AA Cell or C Cell options. 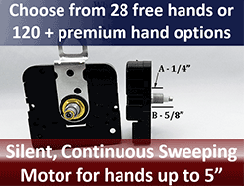 How do I choose the right size clock motor & hands? 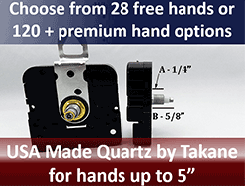 2) The size of hands is based on the length of the minute hand from the mounting hole to the end of the minute hand. (Figures 3 & 4 above) Most can be slightly trimmed if need be, and they are all USA made of aluminum. Our customers also spray paint them. 3) Our clock motors are sized by the thickness of the dial the movements can go through. 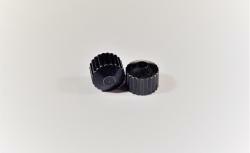 EG Q-16 below will go through up to 3/4" thick material. If your material is too thick, consider removing some to in-set the clock. Or if your clock face material is too thin, consider adding some material behind the face so the hands will sit closer to your clock face. 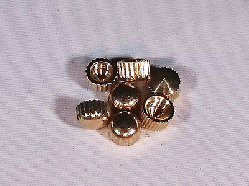 4) If you are using a glass or plastic cover over the movement, make sure you have at least 1/8" extra clearance as you will need room for the second hand. 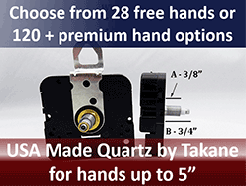 Our mini quartz clock mechanism fits a 3" hole if recessed. 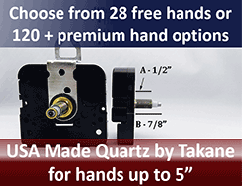 Hands - choose one per motor or add some extras. 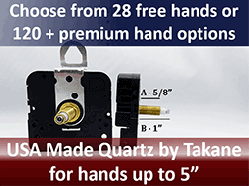 28 options that are free and include a minute, hour and second hand. PLUS about 75 styles / sizes sold separately. *See product details to know if a second hand is included. 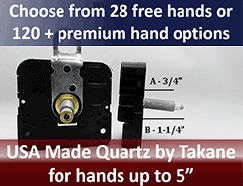 » USA Made Clock Motors with Large Clock Hands from 6 to 18"
» Simple step-by-step instructions for assembling your quartz clock movement with our USA Made steel clock hands. 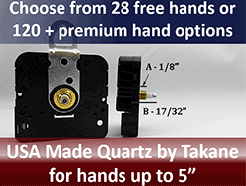 » Quartz Replacement Clock Movement + Hands up to 18"
Gold, Silver, Black Bezels - A Complete Clock! Enjoy years of quiet time! 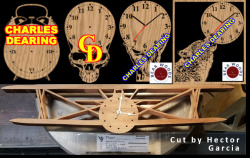 » Fantastic Clock Making Patterns For Scrollers! Copyright © 1987 - . Bear Woods Supply Co. Inc. All Rights Reserved. Use the table above to know your price and when discounts apply. Eg. Sawtooth Picture Hangers are sold "Per Bag of 100." If you Add "1" to the Cart you will get a bag of 100. Discounts will follow the pricing table. Wish Lists you can share, Faster Ordering and More! Some great features to make shopping easier.